From 2001 to 2011, South America was one of three areas in the world (along with China and Eastern Europe) that significantly expanded its middle-income population, according to a new Pew Research Center report. Driven by an abundant supply of commodities for export (oil, copper, iron, soybeans, beef, etc.) and a surge in commodity prices worldwide, many South American economies prospered from global trade and from the steady demand of resources in an increasingly industrialized China. South America’s middle-income population grew 11 percentage points, from 16% of the region’s total population in 2001 to 27% in 2011, and the share of people who were poor dropped 10 points in the same time frame, from 17% to 7%. By contrast, the economic status of people in Central America and the Caribbean went mostly unchanged from 2001 to 2011. The middle-income share of the population grew only modestly, from 19% to 21%, while the share that is poor declined by just 3 percentage points. 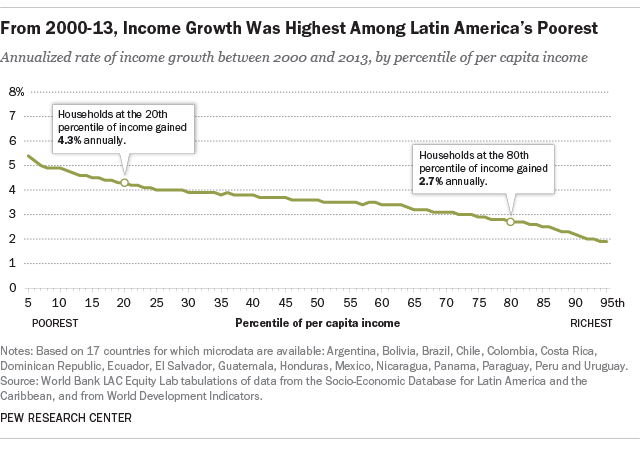 Meanwhile, Latin America overall saw its income gap narrow over time. From 2000 to 2013, the incomes of poorer households grew at a higher rate than incomes of richer households, according to the World Bank. 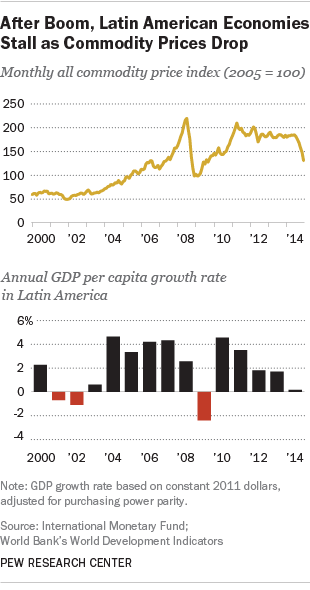 But the economic narrative in Latin America has shifted in recent years. Progress in reducing inequality stalled from 2010 to 2013, based on the latest available data, and overall growth slowed as commodity prices dropped and economic momentum waned. In its April 2015 report “Northern Spring, Southern Chills,” the International Monetary Fund predicted that growth in Latin America will decline for the fifth straight year. The weakness is concentrated in South American countries, which are much more dependent on commodity exports – and are more affected by the drop in prices and by China’s slowdown – than the rest of the region. Prospects are brighter in Central American nations as well as Mexico, according to the IMF. These countries are likely to experience steadier growth moving forward, partly due to their closer economic ties with the U.S. – through trade, remittances and tourism – as the U.S. continues its recovery from the Great Recession.